You mean because a group of people are calling the massive immigration "La reconquista", its deemed true I'm pretty sure if it follows ones agenda, one is willing to believe anything. The 'massive immigration' of overwhelmingly unskilled, uneducated people that we neither need nor want from south of the border has to stop. I don't give a rat's nest what anyone calls it. Why are you wasting your time even trying to debate with this guy? He has shown he does wish to accept facts when they shown to him. So as it turns out you believe fact based on someones written word, just as it flows along with your agenda? Again, real genuine dude. Well, Guy and APJ were claiming elsewhere. That they're "taking over" the southwest. You'd have to be pretty full of yourself to believe that. They must be very loosely educated because they clearly fail to grasp this very simple concept. It does have relevance because the really big breeders are directly from Mexico and are using food stamps, WIC, Medicaid and all the rest to support their large families. Mexico has one of the fastest reproductive rates in the world especially among it's lower classes. One reason Mexico demands unlimted immigration is that it does not want to support that many mouths in Mexico. They wish to use the USA as a population safety valve. I doubt legal long-time American-hispanics with roots going way way back in this country are having many more children than other Americans as it costs quite a lot to raise a large family here. Those who want to live the middle class lifestyle tend not to have baby after baby especially with no husband in sight. Don't forget Aid to Families with Dependent Children - I found a reciept for "AFDC" ($265 per month) in my yard belonging to a lady at the address of the 12-15 or so illegals living across the street from one of my rent houses. They illegally converted a single-family home to a four-plex but code enforcement will do nothing. You would have to be an uneducated oaf to not know it and see it. Most people with some grey matter know what has happened in the southwest part of our country and of course it is continuing in the rest of the country also. Hell, the damn Mexicans are also illegal in Hawaii. "Oh shi, the president of Mexico said where ever there is a Mexican, there's A Mexico. Doesn't that sound like Aztlan"
"Yeah it does! lets write about it." 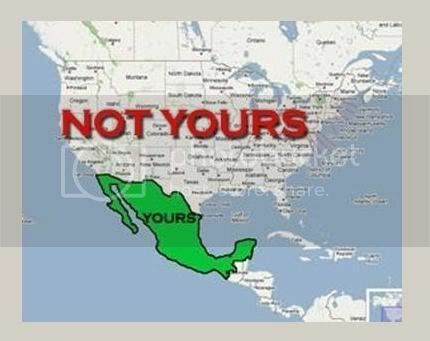 Where is the claim that Mexicans are going to take over the Southwest to fulfill their shat-filled dream called Aztlan? I don't see that in the article. I wonder if the British sentiments were exactly like yours. "All these Europeans coming to America, they're going to conquer the place!!!" Lazy aren't you? look all of that stuff up. I have got to get back to work right now. You really are like so many others expecting others to do your work for you.